I have been dilatory as regards posting, but I hope you'll forgive me. My B.Ed. students come back this week and I have been working hard to get ready for a very heavy teaching month in September. However I do have a few things to share with you. First, you may remember that I was casting around for a hand sewing project that wasn't hexagons. 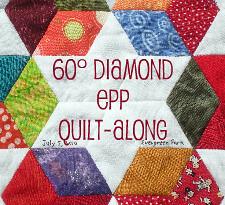 Jessica suggested diamonds, and she pointed me to a handy video she had made about how she uses Quilt Patis 1.5" diamond templates. I thought her work was so pretty and I thought it might work for me. So I ordered a pack, to try them out. I wanted something to take with me to Memphis for my father's 70th birthday celebration, and they arrived in the mail the day before I left. I just had time to cut a whack of fabric diamonds to take with me. Here's what they look like - the directions say trace the template, but that's far too tedious. I do what Jessica suggested: cut 2 1/8" strips and use the 60 degree angle line to cut diamonds. You piece them together in segments - in this photo, you can see the plastic Quilt Patis in the back of the work; once a plastic piece has been joined on all four sides, the template can be popped out. I was a bit slow getting started, but here's what I managed to get done over the four days I was away. The photo at the top of the post shows what I've done to date. My trip was quite eventful - and not all pleasant. I was 11 hours late arriving in Memphis due to a plane malfunction and various weather systems. I was glad to have my new hand sewing project to keep myself occupied and distracted from things I didn't want to know about - like how bad the weather was. I really really really hate flying, and I was especially nervous, when, on our way into Atlanta, the pilot came on the speaker and asked the flight attendants to stop preparing the cabin for landing and to sit down and strap themselves in. We flew into quite a storm and the turbulence was bad - so bad, in fact, that as I kept myself busy by sewing diamonds together, a particularly bad bump made me poke myself in the face with the needle! Fortunately, I stabbed myself in the chin, not the eyeball! The thunderstorm over Atlanta caused a further delay in my travel. When I finally arrived in Memphis, I was amazed beyond belief to find that my bag was actually on the same plane as me, since I had been rerouted twice and had been on three different airlines. 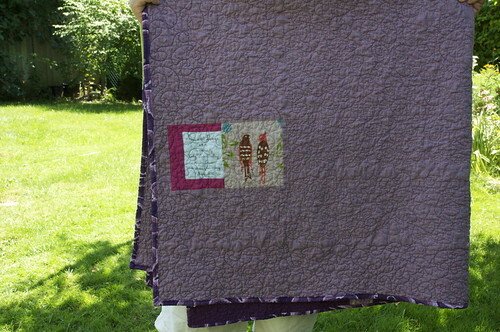 And so grateful - since the quilt I made for my father was in my suitcase! However the adventure wasn't over, because I soon found that the Atlanta baggage handlers had left the bags out on the tarmac while they waited for the thunderstorm to pass. I kid you not - I was wringing water out of my clothes and the quilt. I hung it over the shower rod in the hotel that night and spent an hour the next morning drying it with a hair dryer! But all's well that ends well - I'm happy to report that my father was thrilled with it, just as you all predicted. In other news, I wanted to share what I finally decided on for my month in the Incredible Shrinkers bee. I'm asking everyone to make me a Snail Trail block. 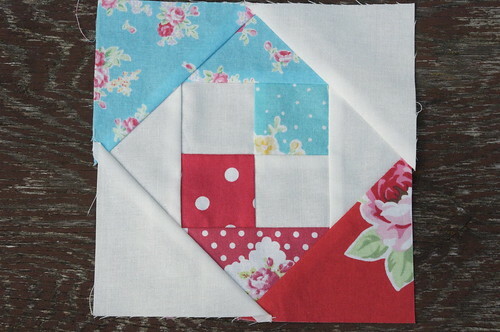 I've always loved this block, and I have some very sweet red and aqua fabric, mainly Lecien Flower Sugar. The single block doesn't look like much, but when assembled with red and aqua setting blocks, it will look magnasplendent! 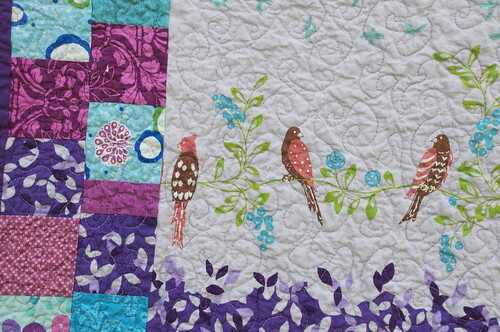 Insert brass fanfare here: My purple Love Birds quilt is featured on Quilt Story today! 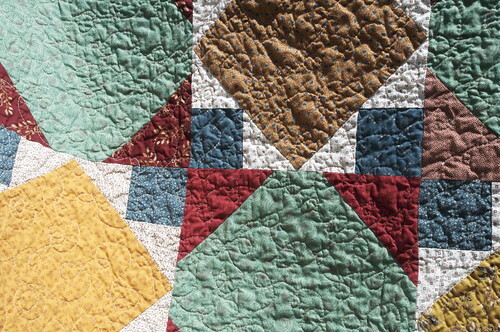 Quilt Story is run by Heather and Megan, the two ladies behind Fresh Poppy Design. 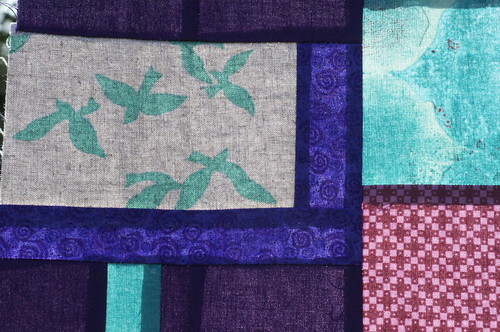 Quilt Story is their blog that features different quilts from around the blogopolis. 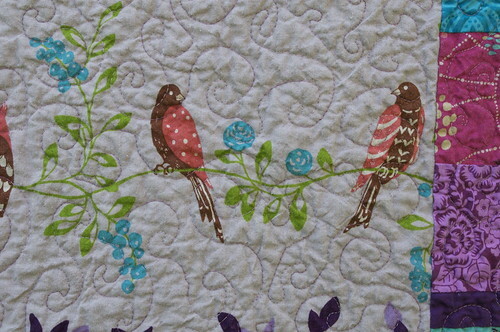 If you're a regular reader of my blog, you'll have seen Love Birds pretty recently already, but go have a look at Quilt Story to see some of the other quilts that have been featured. Cheers, Megan and Heather! P.S. If you are a young pup and didn't get the reference in my post title, see the trailer for Sunset Blvd below! 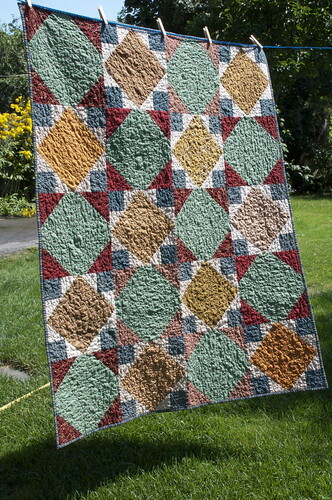 In my last post I kind of moaned about the quilt I was making for my Dad. The four kids are convening in Memphis this weekend, where my brother and his family are hosting a shindig in honour of my father's seventieth birthday. I wanted to make him a quilt. I fixated on making a "manly" quilt, which to me meant subdued colours and staying away from a lot of fussy little pieces. I saw this pattern in a recent copy of Quick Quilts, and it seemed like a good choice. 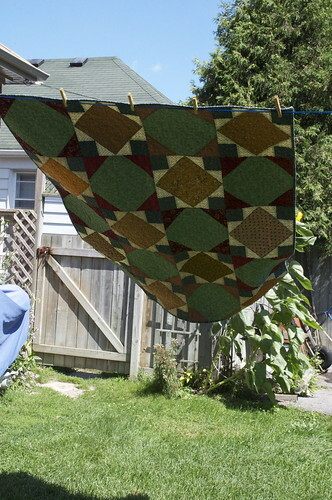 The pieces were large and manly and I knew I had to have colours in my stash that would go along with what I thought a man's quilt should look like. But, oh! It just looks [wrings hands] homely! Do you see what I mean? Just the slightest bit ugly. Plus, instead of looking manly, it looks like an old man. Now you may argue that at 70, my father is an old man, but he wouldn't thank me for pointing that out! In a comment on my last post, someone said my father would love it because I made it for him. Let's hope that's true, because, honestly, I think this is a quilt that only a father could love! This is a special birthday for him, because it was very long odds, indeed, that he would ever see this milestone. My father had cardiomyopathy and was very ill for a long time. He could not climb a flight of stairs or walk to the corner. Seven years ago, he had a heart transplant. Three cheers for Vanderbilt's transplant team, and above all, three million cheers for a very special family, whom we do not know, who allowed this gift of life to be returned to my father. I have signed my organ donor card. Please consider signing yours. Oh my - I can't believe we are at the middle of August. Where has the summer gone? 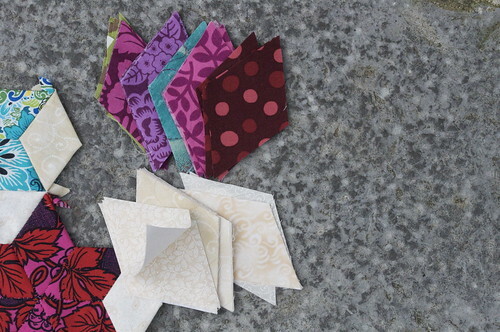 I am in the middle of making yet another gift quilt. This one is a real failure, I am afraid. I'm making it for my father's 70th birthday - we are having a family party in Memphis next weekend and I wanted to make a lap quilt for him. I wanted to make a "manly" quilt, but I didn't have much of a plan beyond that. And it's turning out....flat. The top is done, and I'll be working on the quilting today. 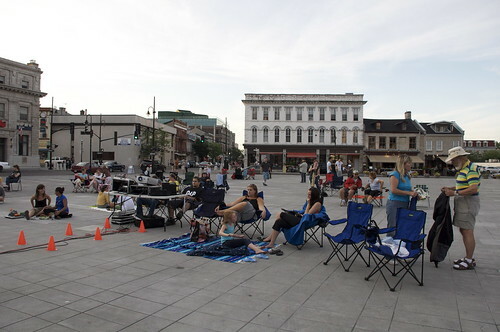 There are no photos of it at the moment because the weather isn't conducive and because I don't have the heart to show it right now. 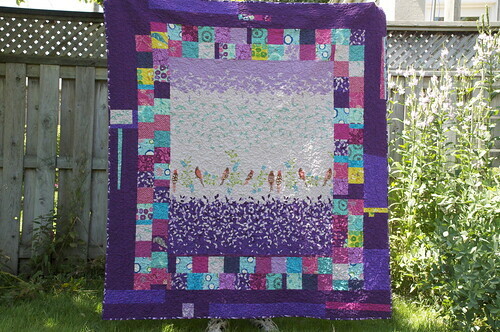 Please, O Quilt Deities, make this one look ultra-fabulous after it's quilted and washed! We've not been too successful at getting out and about while my daughter has been at camp this summer - as a counselor, this year. 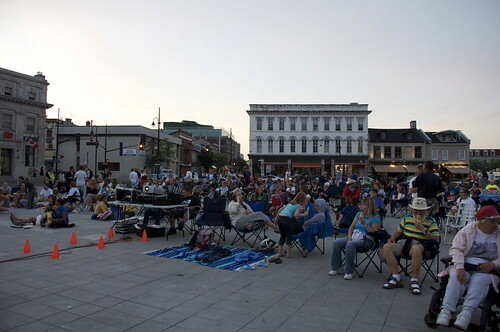 However, we did manage to get downtown a few nights ago for one of the weekly Movies at Market Square. 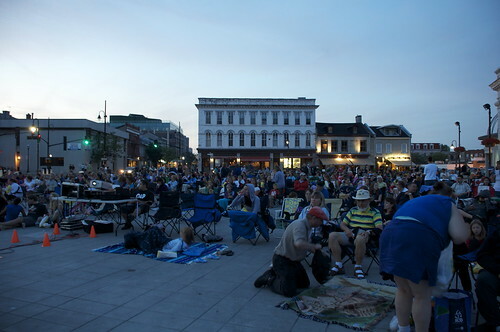 These are some photos I took at one of last year's movies. 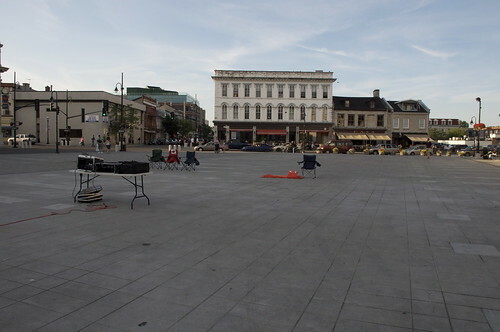 I thought it would be interesting to see how the square filled up with viewers. Obviously, the sooner you get there, the better seat you can grab. 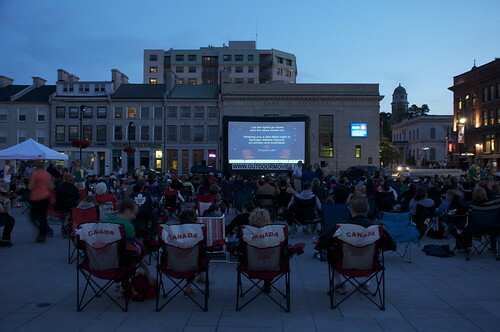 I do love these opportunities to watch familiar movies in the open air! The one we saw a few night ago was Some Like it Hot, with Jack Lemmon, Tony Curtis and Marilyn Monroe. Oh my word, what a funny movie - and can you believe it is 50 years old? It holds up so well - the jokes, the pacing, the age-old story of mistaken identity. I've lost track of how many times I've seen it, but it always make me laugh out loud. And what about Marilyn's big bum and bosom? Wowee! Watching her strut her stuff makes me feel a whole lot better about all my goods! 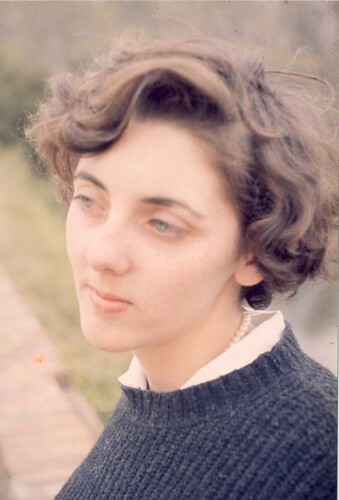 Finally, I can't let today go by without marking the anniversary of my mother's passing. She has been gone for two years, and I think about her and miss her every day. 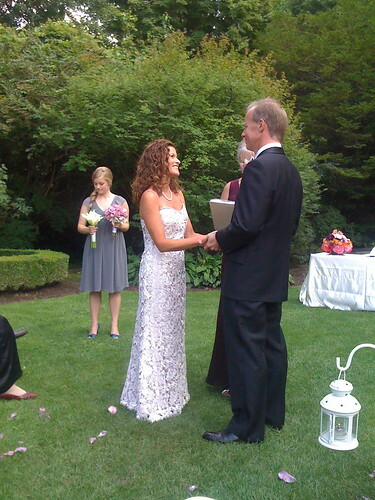 Happy wedding day, Denys and Nina, originally uploaded by Shadrach Meshach & Abednego. This one went down to the wire, friends! 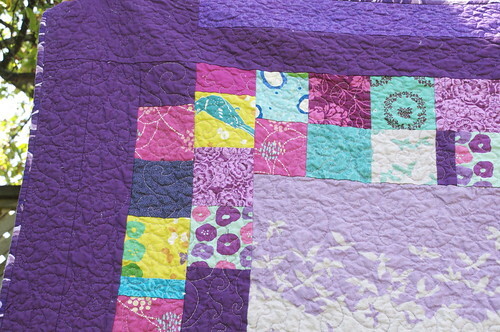 I stayed up very late to finish the quilting and sew the binding to the quilt sandwich. I watched many episodes of The Jewel in the Crown while I was doing the FMQ - I had forgotten what a good series that was! It was a pleasure to see it again. I couldn't finish off the binding - I was seeing double by the time it was sewn to the quilt top, and it was 3am before I found my bed. I forced myself out of bed at 7 to baste the binding and then sew it on. I don't know how people manage to machine-sew binding on when it is held in place with pins - my hat is off to them! 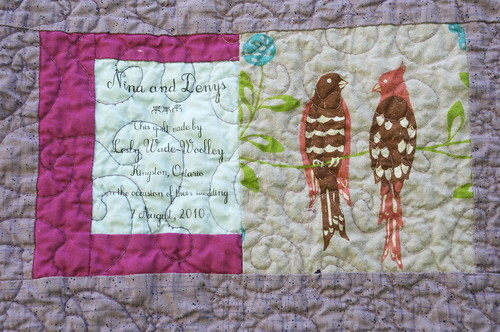 I would have hand-stitched the binding in place, since it was for a wedding present, but there was no time. As it was, I packed my overnight case while the quilt was in the wash, and took my shower while it was in the dryer. I whisked it outdoors for some quick photos while my husband was tapping his foot and looking pointedly at his watch. We raced down the 401 to Toronto and checked into the wedding hotel - which, as it happens, was the same hotel where we spent our wedding night, 24 years ago! I was very happy with the label for this quilt. 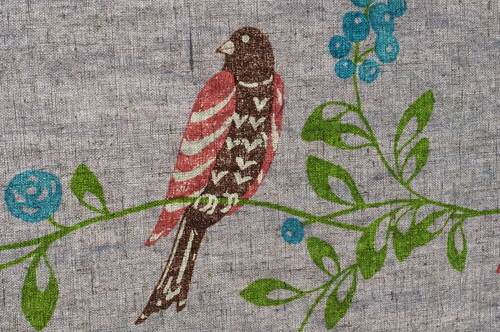 I printed it on one of those Printed Treasures sheets, and then pieced it into the back, with a piece of the linen showing the two lovebirds. I've used these printing cotton sheets before, but this is the first time I've pieced in into the back. I like it! The groom has been a friend of ours for many years. This was his second marriage, and his son and daughter were the only attendants. I had never met the bride, and I hoped she liked purple. 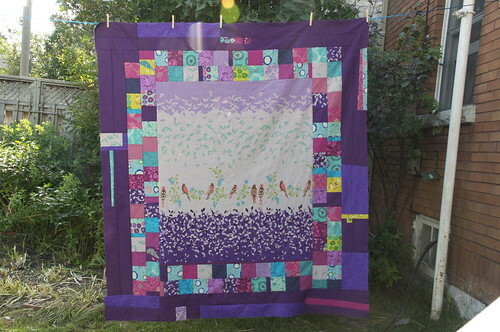 While I felt fairly sure that Denys would like it, I had certainly been second guessing myself as I put this together - what on earth was I thinking, making such a hugely and utterly purple quilt for a woman I had never met! Purple isn't everyone's cup of tea - maybe she would be a purple-hater! Imagine my relief to see that the underslip to her elegant lace gown was a beautiful soft purple! 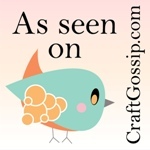 Updated to add to the Blogger's Quilt Festival! Love Birds, originally uploaded by Shadrach Meshach & Abednego. Thanks, everyone, for your advice. It was really, really helpful. From reading over everyone's comments,it seemed that the general feeling was that it needed a bit more than the plain row of squares that I showed you last time, but that the spiky border I had envisioned would be too much. And yet, a plain border would perhaps be too stark. 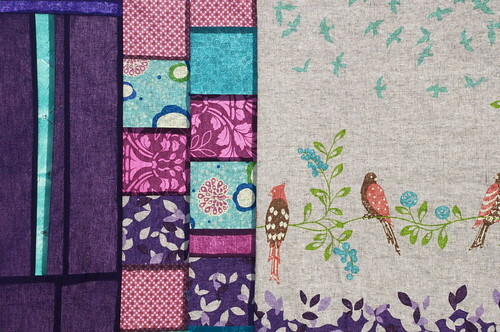 So I used the remaining purple that I had to make a border, inset with some of the linen and cotton from the squares. I had to augment with this purple blender fabric. That blender fabric looks bluer here than it does in real life, where it does its job and blends a bit more successfully than one would imagine from the photo. I also saved the words to go on the back, as most of you suggested. 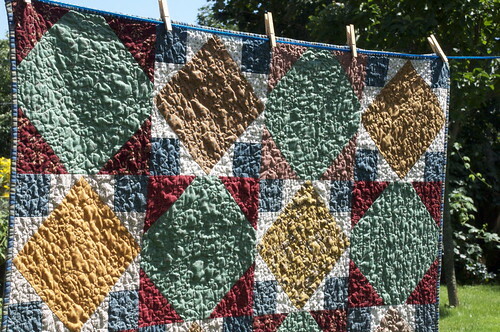 I do worry that the quilt top looks a bit like a hobo parade, and I have to confess that I think it just misses the mark. The fact that I am working to a desperate deadline and that I was restricted to the fabrics I had on hand (LQS is closed on Sunday and the civic holiday today) are more explanations than excuses. Oh well. 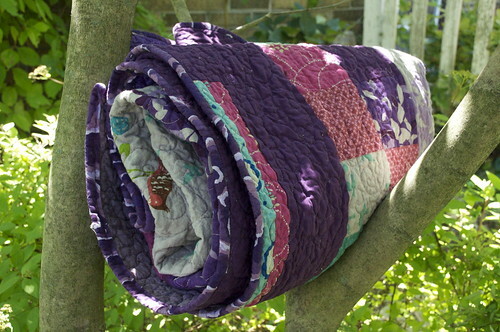 I keep reminding myself of the magic that happens once a project gets quilted, bound, washed, and dried, and comes out all crinkly and any harshness or starkness is somehow soothed away. Please keep your fingers crossed for me! What I do like about this is the wonderful linen panel in the centre. I have another one that I kept for myself - the same print but green instead of purple. 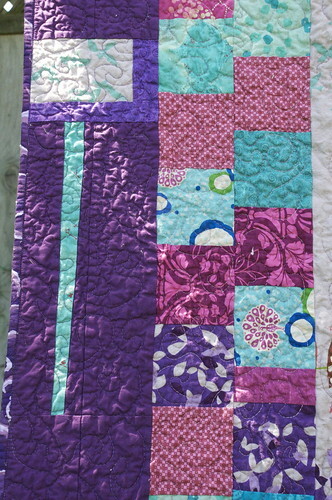 After this one is all quilted, I'll think carefully about lessons learned and then try again. 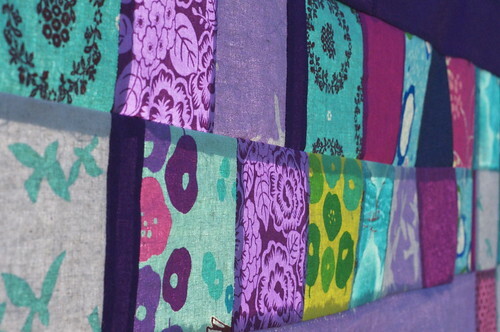 I do love how these fabrics show up against the sunlight. And here's another question for you. 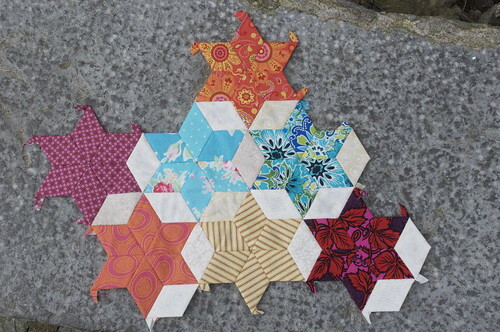 I think I would like to start a hand piecing project, but NOT hexagons. I am utterly saturated with seeing hexagons all over the blogopolis, and I just don't feel the love. 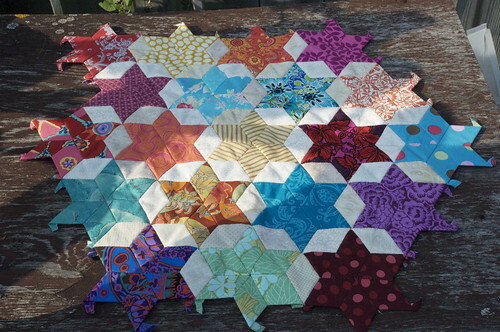 But I do see the appeal of having a project that is portable and I would like to build my hand piecing skills. 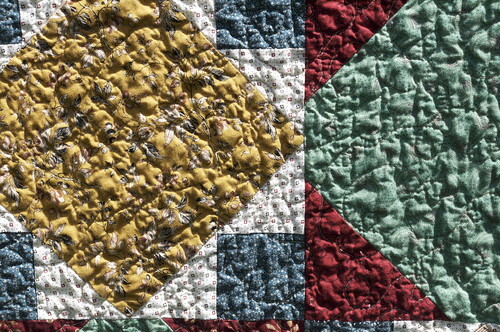 (Not hand quilting - I like the durability that machine quilting gives.) 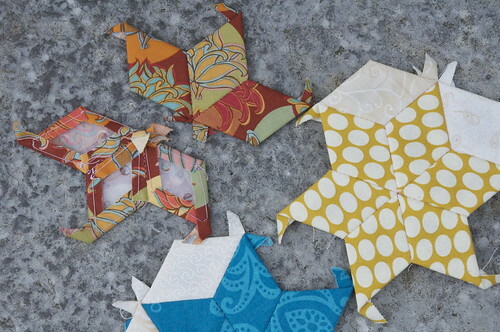 Can you give me some suggestions for a hand piecing project? Cathedral Windows, for example?